The top picture is an early postcard of Matlock Bridge and Matlock Bank published by G.W.W., a firm begun by George Washington Wilson of Aberdeen who died in 1893. It would have been taken from the top of High Tor. In the foreground are the quarries and other buildings surrounding the former Boat House Inn, with the Harvey Dale Limestone Quarry belonging to Job Greatorex and his youngest son extreme left and middle. The Derwent Railway Bridge and the iron footbridge across the river Derwent are on the opposite side of the road. Beyond in is the railway embankment with the wooded slopes of Pic Tor beyond that. The shops and houses of Dale Road are just below the centre of the picture. The original photograph would have been taken between 1893 and 1900. On the far left, close to the top of the hillside, are the houses of Smedley Street West and Hackney. The cable tramway's depôt with its tall chimney can be seen at the top of Rutland Street but otherwise the Bank is not overly developed. Bridge House is surrounded by trees, making it impossible to see whether it had been altered to become the Town Hall. Having said that the surrounding trees were cleared around the time of the 1899 extension. The earliest houses on Edge Road had not been built either. This enlargement shows us the relatively newly built iron railway bridge, with the small building at the end. This had been a boat house and was to be converted into a drill hall. 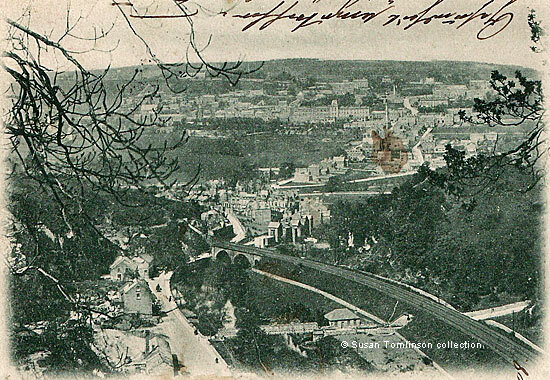 This is a similar view, also taken from High Tor in the early to mid 1890s. which was being built by the firm of John William Wildgoose of Matlock in the summer of 1894. The chimney is not shown on the top image so this picture was taken slightly later. The writing along the top of is a part of a message that was written all around the edge. 1 and 2. 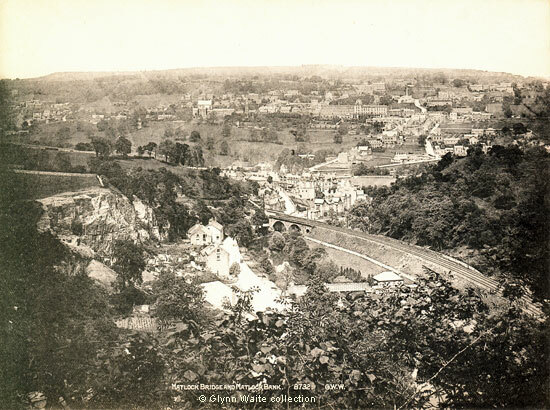 "Matlock Bridge and Matlock Bank", published by G.W.W., No.8732. (G. W. Wilson & Co., Ltd., 1852-1908, 2 St. Swithin Street, Aberdeen, Scotland). In the collection of and provided by and © Glynn Waite. 3. "Matlock Bridge & Bank". The "Wyndham" Series, No.2099. Undvided back. Posted in 1908 from London, as the card bears a Hampstead address. Sent to Arthur Hopnau in Dresden and re-franked there on 3.12.08. Message in German, included Lnd. 1/XII 08. In the collection of and provided by and © Susan Tomlinson. "Derbyshire Advertiser and Journal", 28 July 1893.